It’s a bird! It’s a bed! Wait, it’s an earthquake shelter! In the wake of the devastating earthquake in Haiti in January, I’ve been thinking a lot about earthquakes, especially now that I’m living in an old building in San Franciso; a dense city in one of the world’s most earthquake prone regions. Having grown up in California and Japan, earthquakes aren’t unfamiliar to me. I can remember at least two tremblers when I was a kid, where my parents raised us in the middle of the night and lead us under the dining room table as our home rattled around us. My grandmother’s house was destroyed in the Kobe earthquake in ’95, though she fortunately survived unscathed. Above is a picture of my frame, mid-construction, flipped upside down. It’s basically a two-by-four frame with one-by-six slats on top. As you can see, the main improvement I made was to reinforce the legs in both axes using diagonal supports. Although not visible in the picture, I reinforced the cross beam in the middle since it spans 50+ inches and is only supported on both ends. Here’s a close-up of one of the corners, where you can see the front head-board post stick up vertically. 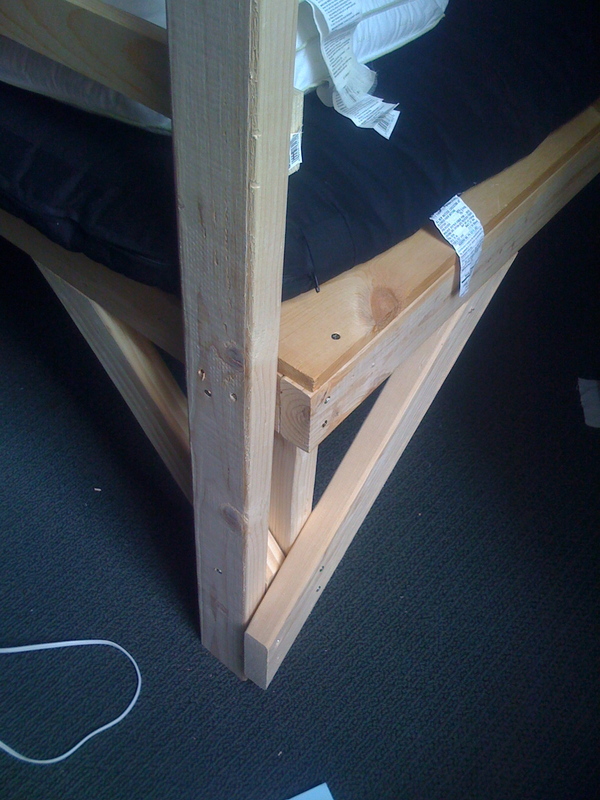 The 2-foot long leg and head-board post are both attached to both diagonal supports. 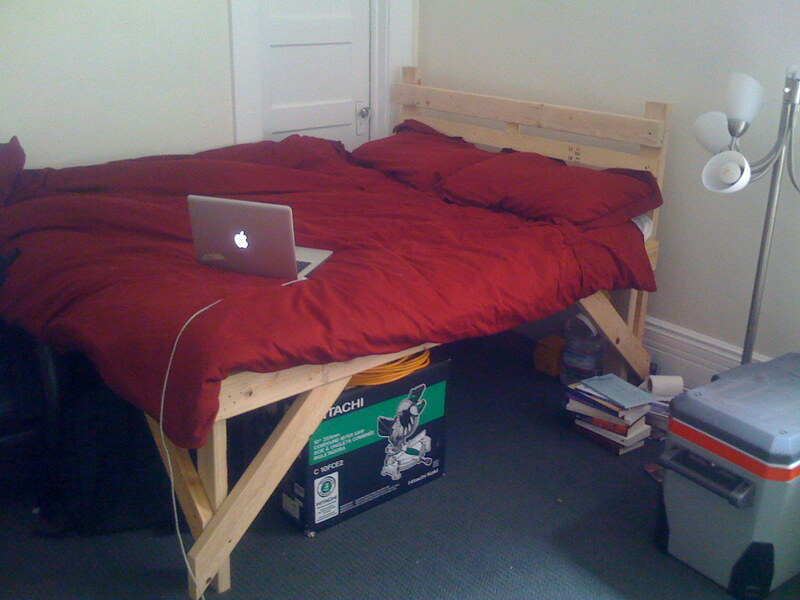 Here you can see the bed in its final place and configuration. You can see that there’s ample space underneath. I also placed the bed in the corner, where the walls will hopefully provide a little extra support, and also where I have a 2nd door that might give me an exit route. Under the bed, so far, I’ve stashed a 1 gallon bottle of water, a full 7 gallon water cube filled with tap water (which I’ll need to rotate every so often), and 2400 Calories worth of energy bars. That won’t last me forever, but should I survive the actual quake, that should keep me alive for a couple of weeks. 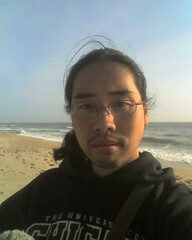 The next step is to shore up my supplies. For instance, I need to figure out what I’d do with waste products. I also might want a flashlight, some candles (because nothing warms up one’s heart like a candle light), maybe a space blanket, something that’ll make noise (or a SPOT) to alert rescuers, and so on and so forth. Most of these supplies would be good to have, even if my roof doesn’t fall on me. To some of you, this all might seem like excessive paranoia. But the thing is, in case you haven’t noticed, earthquakes are real. They happen, possibly without any warning. But the other thing is, just a tiny bit of preparation could go a long ways. 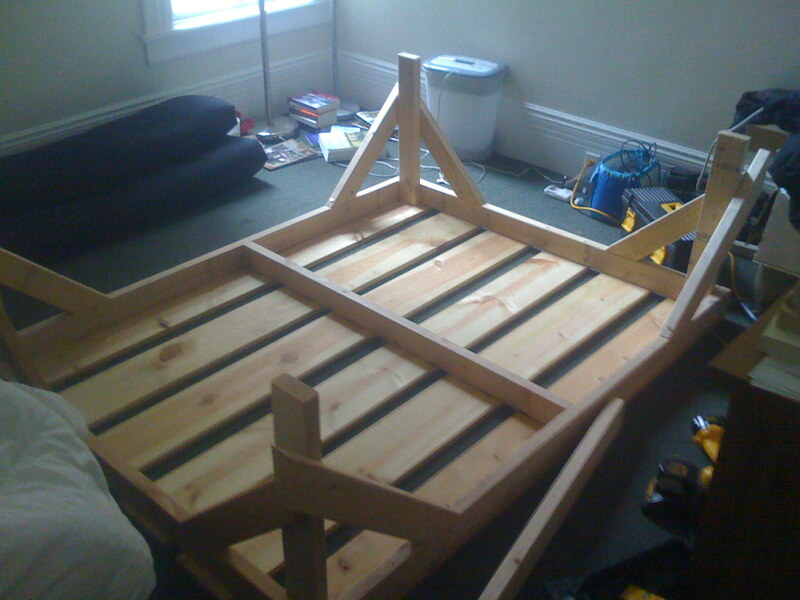 Reinforcing my bed frame cost less than $10 in extra lumber, and maybe an extra hour of construction time. A $1 container of water could keep you alive for an extra week or two. One of the last guys to be pulled out alive in Haiti survived under a desk, off of soft drinks, booze, and snacks for 11 days. So, the little things are nothing to laugh about, and the question shouldn’t be Why?, but Why not?. Finally, if you’re still not convinced, this rather sobering article about earthquake preparedness in the US might be a good read.